January 20, 2017, 10:12 AM · I have no idea; I obviously haven’t heard even a fraction of what’s out there (and there’s a lot). And I'm certainly not an expert! But my unreasonably ambitious 8-year-old (currently working on Paganini Caprice No. 24, among other things) is always getting comments on how good his quarter-size one sounds (he gets more sound out of his quarter than his current duo partner gets out of his half), especially his G-string — always the weak point of fractional instruments -- and I wish someone had let us know about this option sooner! For most students, it probably doesn’t make that much difference what sort of instrument they have. We too were in the grind of higher-end Chinese instruments in the $600-700 range, for years, and had no idea that for just a couple of hundred more, you can get something much more like a real instrument. 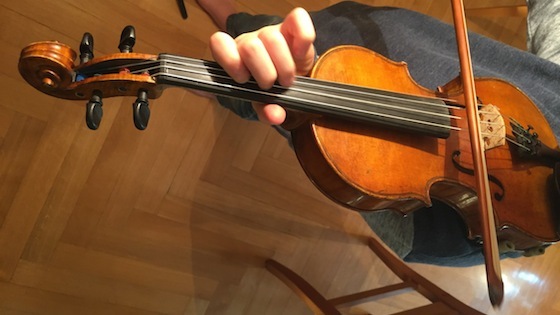 If your aspiring young violinist is showing any promise at all, or even an interest, or if you’d like to give them a *chance* at showing promise by letting them have an instrument that can actually respond to proper bowing (i.e. give them the feedback they need), then consider getting a Kono. Hiroshi Kono is a Japanese luthier who also sells in the US via a few dealers. We got ours via Bill Weaver in Bethesda, MD. From time to time we’ve compared my son’s Kono with other quarter-size instruments, and have gone to reputable violin shops to try some out. Our experience is limited; we’ve tried a couple of places in and around Los Angeles and one in Munich (Germany). Most of the instruments available are the usual Chinese ones. These can be ok, but the Kono always stands out. More surprising is that it obviously beats the more expensive instruments we’ve come across, too. Most shops don’t stock expensive quarter-size violins, but you can find some at three or four times the price of a Kono that can’t begin to compare to it. My son is rather scathing after these comparisons: "That $2000 one was totally feeble compared to mine!” he’ll say, "Did you hear that squeaky G-string?" Or: “Nothing in that shop came *close* to my violin!” In most cases, even the dealer agreed that we were better off with what we had. My son is just about ready for a half now, and he won’t hear of anything other than a Kono. Like all kids at this stage, he’s impatient to get on the larger instrument, but he’s also reluctant to part with his current one. Only the thought that he can move on to a larger version of the same thing keeps him enthused about making the change. We’ll obviously keep an open mind about anything that comes along; when an 8-year-old is that advanced, he should obviously have the best instrument we can afford, but if it lives up to his expectations, I suspect he’ll feel the same way about the Kono half as he now does about his Kono quarter, and in a year or two he’ll be insisting we move up to a Kono 3/4. January 22, 2017 at 10:34 PM · I would love for people to share their experiences with good-sounding fractional violins. Because they are not easy to find! Are there other brands that people are finding, with excellent sound and response? This is actually my former student, and I'm very glad he is still enjoying the Kono violin that Bill Weaver put in his hands! January 23, 2017 at 12:51 AM · Most of our students play on Kohr fractionals, but I've been most impressed with the Eastern European ones from Classic Violins. I haven't tried the Kono violins. January 23, 2017 at 05:19 AM · My daughter used a Gliga Gems violin when she was player 1/4 size up until about a year ago. I was not personally involved in selecting it (her then violin teacher did) nor do I have much to compare it with. As for pricing, we bought it used for about $475 - new price (here in Japan) is around $700 I guess. She switched to a 1/2 last January - and her current violin teacher helped pick out a Jay Haide L'Ancienne. Even as a layman, I could her a huge difference between the one we ultimately chose and some of the regular models. To be honest, we probably spent too much money on it (slightly below 2 grand) but it sounds quite excellent. Interesting to learn about Kono - that's something we will for sure check out for her next step up. January 23, 2017 at 03:09 PM · Hello, we constantly are on a look out for great fractionals for our advanced 9 year old who is currently working on unaccompanied Bach and Mozart concertos. He is currently playing on a 19th century German which has a beautiful tone but unfortunately, doesn't project as well. We are very intrigued by the Hiroshi Kono. Does anyone here know where we can audition/purchase a Kono in Canada? January 24, 2017 at 02:55 AM · Can any one recommend a 1/64 for my 18-month-old who's working on The Last Rose of Summer? January 24, 2017 at 03:21 AM · Kono fractional violins are good but they are like Evah Pirrazi strings: loud without a lot of nuances. My son had a good 1/4 Kono but it had a wolf on the G string which was very inconvenient to play pieces like Zigeunerweisen. When he moved to a 1/2 size we tried Konos and none were great. We found a great old unlabeled French violin at Poter Violin shop not far from Bill Weaver who makes the Konos. We also tried great 1/2 size violin at Brobst closer to DC but they were very expensive. ~$5,000 - 10,000 for a half-size. January 24, 2017 at 05:03 AM · I feel like the Konos are hit or miss in my opinion, and I prefer them I the smaller instrument sizes. When you move to the half, there are so many more options. Set a price range and go try them out! January 24, 2017 at 03:12 PM · Do people feel the same way about bows for fractionals as they do about full-size violins, that the bow is a huge determinant in whether the violin will "project" or whatever? Curtis) specializes in fractional violins. My daughter currently plays on a French violin purchased through him that has a beautiful sound. He has more options to compare between instruments rather than 2 or 3 violins. Think of a table filled with fractionals to play and choose from?! He keeps track of the instruments and asks for them to be traded in when you are ready to size up, so he can keep them within his collection. We purchased my daughter's 1/2 from Mr. Michie and subsequently her 3/4 size as well. I would not dream of going anywhere else! His violins are so special, meticulously maintained, and his service, expertise are top notch. We live in Northern VA, so we are very close to Weavers, Potters, etc as well. Potters sells Kono violins under their brand name "Enzo Seppe." If you are in the DC Metro, do not discount Foxes Music in Falls Church. David Belazis, head of their string department, is great with kids and Konos (sold as "Kono"). We buy all of our strings and supplies at Foxes. Want a great case - he has it or he can get it for you. He generally has several Konos in stock at any given time and will order something for you to try, bows as well. My daughter had a 1/2 size Kono purchased at Foxes before we purchased her French violins in Philly from Mr. Michie that won a competition and was perfect for her recitals. They are great intermediate instruments. It is hard to find artist quality fractionals. We've looked in Chicago, Boston, NYC, you name it. Fractional bows that bounce are VERY difficult to find - any luthier will agree. Check out as many bows as a shop will send home with you and try them out - do they bounce, how is the sound, how is the weight, is it comfortable in your hand, etc.? We had quite a time finding an excellent bow for my advanced (elementary-aged) violinist. Lots of luck!! !